I noticed strange behaviour of wifi driver (ath9k) on my TL-WR1043ND v1.8. TX bitrate (issued by command 'iw dev wlan0 station dump' and showed in Luci Wi-Fi Page) stayed very frequently on 65Mbit/s in pair with Intel Advanced N 6235 on my laptop (under Win 8.1). Sometimes (2 on 10 run of 'wifi' command) tx bitrate pass 65Mbit/s and stayed on 130Mbit/s for some time. It doesn't matter how signal is strong (i tested with different power settings and laptop distance from TP-Link). Also I tested with second TL-WR1043ND v1.8 and got the same result. I'm using r42464 trunk (Chaos Calmer), but the same was on Attitude Adjustment and Barrier Breaker. Only with Backfire (and Gargoyle 1.5.6) 'tx bitrate' was always correct. I tested my Intel Advanced N 6235 with UBNT UniFi and original TP Link and always got 130Mbit/s, so this is not windows driver issue nor wifi card issue. logread and dmesg showed nothing interesting (zero messages like "DMA failed" etc.). Also disabling or enabling ANI changes nothing. I could provide more information if You tell me, how to do. I forgot to mention that when tx bitrate is 65Mbit/s it is impossible to get over 42Mbit/s (download) in speed test, but when tx bitrate is 130Mbit/s i always got 80Mbit/s (ISP limit in my contract). So this is not "iw" command fault or issue. I did some research and i found that is difference in reported capabilities (SM Power Save) between TL-WR1043ND and Intel Advanced N 6235.
this is from command 'cat /sys/kernel/debug/ieee80211/phy0/netdev\:wlan0/stations/c8\:f7\:33\:e5\:b0\:2d/ht_capa' for Intel Advanced N 6235. So TP-Link hardware (with 'SM Power Save disabled') works well with Intel WiFi Link 5100 AGN ('SM Power Save disabled') but have a problem with Intel Advanced N 6235 ('Static SM Power Save'). I tried to disable Power Save for Intel Advanced N 6235, but there is no way int Win8.1 and driver's properties to do. Tested with r42655, still no difference. In case of an upgrade from a previous openwrt-Version: Have you regenerated your /etc/config/wireless? [now delete unneeded parts of the old config like "list ht_capab ..." and only take over txpower and channel- move them to the upper section with pressing "d" "d" and pasting by "p" and "disabled from the new radio section as well as the OpenWRT-SSID-section and the comment]. [so you have a new, combined radio-section and old interfaces]. quit with ":" "x" "Enter"
Background: in BB14.07 the capabilities are now autodetected per device. Adding and removing is usually not necessary. You may have faulty values in your config. I always regenerate whole config (I did it using luci or uci), also I tried to add capability to config by hand, but no results (You confirmed that in BB wifi capability is autodetected, so is not necessary to change it by hand). PS: Please notice that this is a problem in tandem This router and this Intel card (6235), but no problem with older intel card. Perhaps ath9k do mistake in detect 6235 capability and enable "Static SM Power Save" for this card and cause problem described in previous post. My propose is to test customized openwrt build with "Static SM Power Save" disabled for wifi clients, could You? I will test and report. 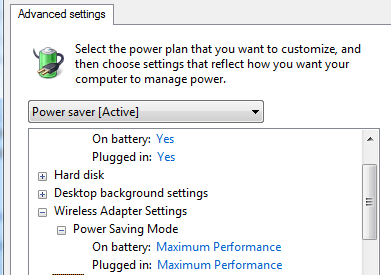 You need to change PCIE power saving, not Wifi Power Saving under Windows power settings.